Not realizing that greatness of spirit could come visiting in any number of unconventional ways, genteel churches refused to admit this man to their company; he was a known publican, a sinner. He openly consorted with wine-bibbers in the taverns, Chinese shopkeepers, common carters and street cleaners, tradesmen of all sorts--the riff raff of society. So when he was rebuffed at the doors of the large white edifices where the parsons wore starched white collars and frowned at the cigar in his hand, he turned back where he was welcome with his Grand Vision--to the taverns, and working places of the busy heart of his great capital. For this man was no ordinary man, he was an emperor--ruling not over men’s heads with a golden scepter and throne based on force and royal pedigree, but ruling more solidly, deeper, ruling in men’s hearts and imaginations. To them he was “Emperor of the Americas, and Protector of Mexico, Norton the First.” What did it matter to that he was self-crowned? What mattered chiefly to these big-hearted folk was that Norton himself believed he was the genuine article, and to them he was a good and kindly sort of man to serve as emperor if they were ever to have such a thing in America. Enjoying hearty German blood sausages with beer mixed with eggs and rum, he read the morning newspapers (he was yet too early for the later editions). From the papers he saw that all was relatively well in his dominions, and thanked the establishment, bestowed his royal blessing upon all beneath its roof, and taking his cigar and his tattered umbrella that he never once opened and departed with his accustomed dignity. The moment he departed the Blessing bore fruit. a caravan of draysmen and their carts pulled up along the street, and all headed in one big group to this one tavern to spend their wages. Recognized everywhere in the quarter, he acknowledged the smiles and bows with brief nods. He turned into a print shop where he had been respectfully received and done business from time to time. The proprieter was very pleased with the royal visit. Royal visits, unaccountably, always brought a rush of unexpected, high-paying orders. Busy as he was that day, after a bow and greeting, he personally conducted Emperor Norton to a chair in his office. A box of fine cigars was offered, and Norton discarded the half consumed one and took a fresh. When the emperor returned the following day, the order was completed and gold paper set round each batch with Norton’s imperial seal affixed. Signifying he was pleased by a rare smile, he took the boxes, carried by a printshop gopher, with him after signing a statement for the payment with his name and stamped seal (he never presented checks or United States currency). He went in at the first saloon and began distribution of his Grand Vision. It created an immediate sensation, and everybody had to have it. He had gone to only three saloons up the street when he ran completely out of the bills. The printshot gopher was sent at a run with an imperial order for 20,000 more proclamations. “He’s gone absolutely nuts this time!” cried the naysayers in vain. “That’s what you get when you humor a madman and a drunkard! Why, there’ll never be a bridge over the Bay! It’s impossible!” Yet popular sentiment--always big-hearted in those days--ran overwhelming in the favor of the Emperor and his Grand Vision. Unfortunately, resources even for San Francisco, the rising queen city of the Golden West, the crown jewel of the El Dorado of the West, were too limited as yet, and local technology not quite up to the task. Over three decades would pass, and the Emperor of the Americas and Protector of Mexico, with his big-hearted generation, were all gone when the Grand Vision finally began to leave the drawing boards and take shape on the shores of the Bay. Emperor Norton had many things right. He started his where the actual bridge started, a spot he himself christened as “Point Alpha” and ended it at “Point Omega” at Oakland. But it was no single bridge. It was a series of bridges strung together that made best sense to the engineers. Take what had worked in the past, and simply multiply it. From the point of San Francisco to a massive concrete tower there would be two suspension bridges riveted together. Thence a third suspension bridge would reach the bay island Emperor Norton had once upon a time dubbed “East Gate Island,” across it would run a broad underground boulevard by tunnel to the other side of the island, then traffic would be conducted via two more steel frame bridges riveted together, thus spanning the miles of deep open water! This vision of the Bridge linking San Francisco his imperial capital to the Celestial City (which, even poetic vision could not deny, was yet only a dusty, noisy, workaday bayside town of Oakland that was struggling hard to gain a degree of Eastern-style respectability), he had first seen soon after his accession to the throne. Somehow the Vision, helped by the glorious sunset and some veiling mist like spells of a magic potion, transformed even this most uninspiring prospect of Oakland, into a Xanadu of pleasure domes built by Kublai Khan, not a lot of oystermen, farmers, greengrocers, saloon-keepers, haberdashers, and carters. But there was more his heart added to the original vision as time went on. By the time when his crown was taken from his head by death, he had seen clearly that there were, in deed, two worlds that required this divine span--two twin worlds fallen from the hand of the Heavenly Father, that were presently divided by murder, hatred and revenge. These must be reconciled, rejoined by the Bridge! he determined. But would his subjects catch his complete Vision! he wondered. The king of hearts tried to issue a final revised edition of the Proclamation, but by then his strength was gone, and he could not rise from his bed. All he could do was pray. Still praying alone, without ecclesiastical rites since the genteel churches declined to send anyone to his bedside, he was startled when he saw a great bridge appear in the mist gathered round his bedside. Angels, he saw, were going up and down on the bridge, which crossed the gulf between ehaven and Earth. Then a dark cloud dove at the bridge, lightning bolts forked out, and the bridge caught fire, burned,and collapsed. This bridge was quickly followed by a second made of the rainbow. It too connected Earth with heaven, only heaven was a tall walled city filled with warriors sporting shields and swords and quaffing from big golden-embossed horns. 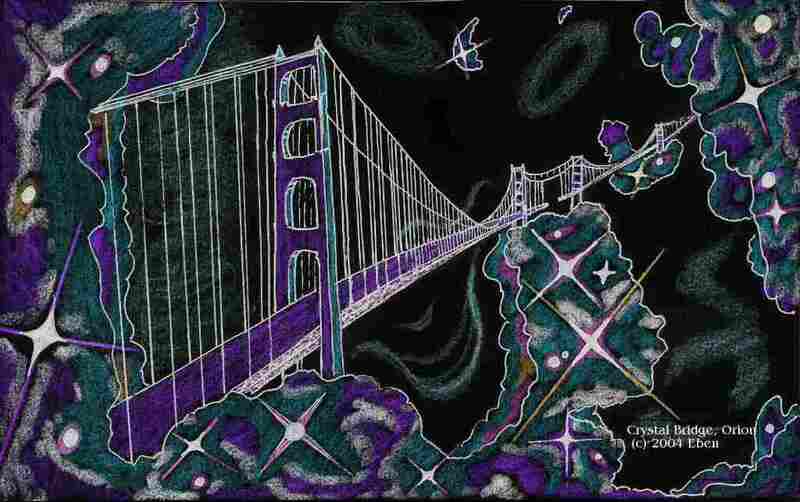 The rainbow bridge and the city in the clouds was swept away by a wind, and a third bridge appeared to Emperor Norton’s bewildered eye. This was a sword, turned on edge, and he watched little dark souls trying to climb it to heaven, but they were falling off and tumbling into a dark, fiery hell yawning beneath. Other souls, dressed like soldiers, climbed it, however, and passed from the bridge into a place of green gardens, fountains, and lovely women lying on couches. The ruined bridge melted away into the river, and its successor was like no bridge at all he had seen. He could tell there was a bridge only because the people in the scene of dark, smoking rocks and broad, fiery planes crossed it--like children skating on transparent ice--and gained entrance into a beautiful set of green hills, flowing streams, and many flowers. Was that heaven? Emperor Norton could not tell. Before he could make up his mind, the “bridge” and the chasm it spanned and the fiery, dark place and the beautiful, park-like opposite side all passed, and he saw another bridge, this time connecting two Earths! Amazed, Emperor Norton watched a dark cloud descend upon it suddenly, with lightning forking out and striking the bridge, just as has happened with the first bridge. And again as with the first, this bridge dissolved in flame, blackened, and fell to pieces, leaving the two Earths separated. Yet this was not the end, for a copy of the bridge began to form slowly between the two Earths, starting from each to the other. Shining like blue stars, it reached out from opposite ends. That was enough for the Emperor! Emperor Norton, who had raised himself up, suddenly cast down the gold crown he thought reposed upon his head. It tumbled and then lay at the nail-pierced feet of the Yeshua that the world had rejected. But the Emperor was at death’s door, and he expired with his Grand Vision glimmering in his heart, slowly dimming like a seed of corn sown in the dark earth. Slowly the vision of the blue bridge dropped and extended itself into the darkness like a string of shining blue pearls as he arose from his bed to follow after it on snowy-white, eagle-like wings.